Tag Inspector is a tag auditing platform that is designed for marketers, by marketers. If you manage a large site or multi-brand enterprise, Tag Inspector’s comprehensive tag library and live tag monitoring across any website will give you unparalleled data quality and performance peace of mind. If you wish to activate the power of your data tomorrow, you need to accurately collect it today. Here are some of the ways Tag Inspector can help you become your organization’s Data Hero! Don’t get caught with gaps in your reports, especially when presenting to colleagues and executives. Identify how each individual tag affects load time and, ultimately, impacts your bottom line. Establish and enforce your data governance and compliance policy to avoid any data leaks (and the PR mess that comes with them). It’s not feasible to manually test and monitor an enterprise website’s marketing tags. Help your team out by automating testing, monitoring and reporting! Why audit and monitor marketing tags? Tag Governance is a process that involves the end-to-end auditing of all marketing tags within an enterprise. Initial tag auditing, as well as ongoing monitoring, are key steps in developing a complete tag governance process. Why Does Data Quality Matter? It’s simple. You need data to accurately measure campaign performance, allowing for the correct allocation of your marketing budget. Just one day of missing data can result in losing 3-10% of monthly conversion details. The results can be devastating, leaving you unable to differentiate between successful campaigns and those that were ineffective. What do you do with the data, beyond initial implementation? Tag Inspector can provide data in many formats, helping the team responsible for monitoring tags quickly make collected data actionable. Raw data can be imported into your database. Our product support specialist can also help you run custom queries to troubleshoot any discrepancies. Tag Inspector data can be aggregated into enterprise dashboards to provide stakeholders with a visual representation of the state of data collection. Once all validation rules are set up, your team will be immediately notified if something happens that may negatively impact data collection or conversions. Tag Inspector is a marketing tag and data quality monitoring solution that validates the collection of online data at the moment of capture. Loss of data doesn’t just impact the quality of reports, but also affects all of your downstream systems, your ability to perform analysis, and can even reflect poorly on your individual performance. Don’t let data go missing! Ensure that every click, conversion, event and transaction is collected, or get an alert in real-time. Increasing the number of third-party vendor tags is a primary contributor to increased page load speeds. 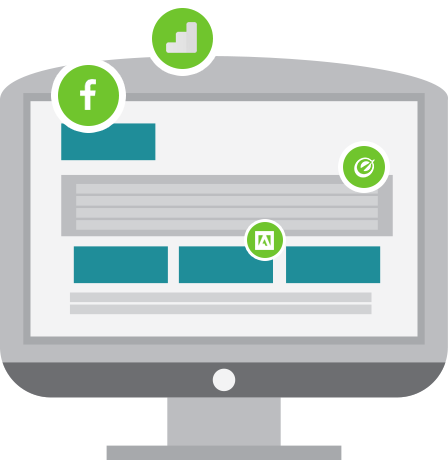 Each tag impacts your page load, and each page load impacts your revenue and sales. Do you want to risk it? Tag Inspector, a tag performance solution, can help you test and measure the effect of every single tag on your site speed, and, therefore on your sales. Using this information you can determine problem tags and develop a plan for optimization of tag architecture to improve site performance. An average website has between 50-65 marketing, analytics or other pixels deployed on the website as a result of various organizational efforts. Implementation of a tag management platform is a great start to manage and establish a level of oversight around how these platforms function and the data they collect and share. However, enterprises need a more comprehensive data collection and ownership process. Tag Inspector provides you with everything you need to conduct an audit of all technologies and pixels, as well as developing a process for removing non-essential technologies and adding new technologies in the future. Together with a tag policy, we will help you establish these critical processes for how you collect information, secure your information and apply the data to optimize your marketing and business practices. Marketing technologies, when applied correctly, can give you a winning advantage over your competition. Let us help you put a process in place to maximize your ROI and manage your technologies the right way. © 2019 Tag Inspector. All Rights Reserved.